What can you get for R30? A cappuccino… Tick. A toasted sarmie… Almost. A movie ticket… Not likely! 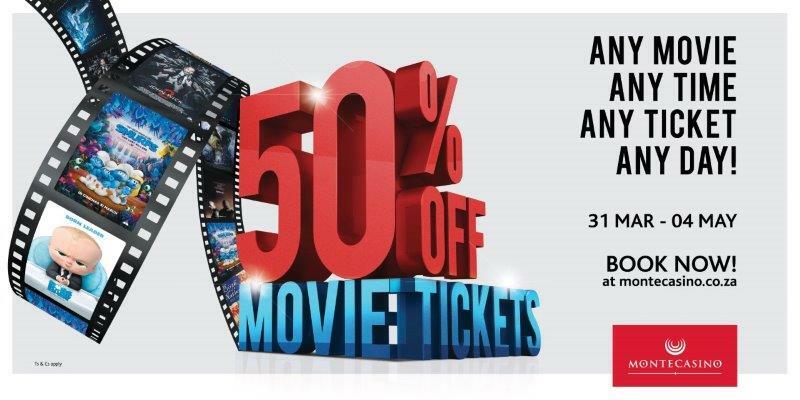 Except at Montecasino where, for the month of April, all the way through the Freedom Day and Worker Day long weekend, Movies@Montecasino is offering movie-lovers a whopping 50% discount on all movies, any day, at any time. As if that wasn’t enough to fill your days with movies, the movie line-up includes Smurfs: The Lost Village, and science fiction crime drama, Ghost in the Shell. New releases include the latest in the Fast and Furious line-up – New Roads Ahead: Fast 8 and the remake of Disney’s 1991 Beauty and the Beast, featuring both live action and computer animation. Two not-to-be-missed movies taking to the big screen are Marvel Comics’ Guardians of the Galaxy 2 and the new action-comedy film Baywatch, based on the television series of the same name. The 50% discount runs from 31 March to 4 May at all three of Tsogo Sun’s Gauteng entertainment destinations – Montecasino, Silverstar and Gold Reef City. The half price applies to both 2D (discounted to R30) and 3D (discounted to R75) movie tickets and is also valid on kids’ and pensioners’ full price tickets. It does not apply to pre-release screenings, WOW Wednesday promotions, any cardholder discounted promotions, or refreshments. For more information, visit www.tsogosun.com/montecasino or facebook.com/Montecasino.